08 Sep Herbert Peabody is back! Let me tell you about the birds and the bees, and the flowers and the trees, and the season we’re fond of, and a kids book that we love… Jewel Akens’ 60s hit popped into my head while thinking about the important ‘birds and bees’ talk we need to have with our little ones. No… not that talk. Although that’s very important too. I’m thinking about the ‘Where does our food come from?’ talk with the kids. When thinking about our food, bees really are the VIPs of a garden and it’s good to have the talk about their essential role in our garden. To help make the talk about pollination and food production interesting for kids, Herbert Peabody is back with another fun-filled adventure. You may remember Herbert from when we last stopped by his vegetable patch, but if you missed that you can read about it here. The second book in the Herbert Peabody series by Bianca C. Ross has been released and spring is the perfect time to share it with little ones as there’s a real buzz in the air. In Herbert Peabody and the Incredible Beehive, we visit Herbert at Mulberry Farm again for a story that reconnects kids with where their food comes from and highlights the importance of bees in our food chain. 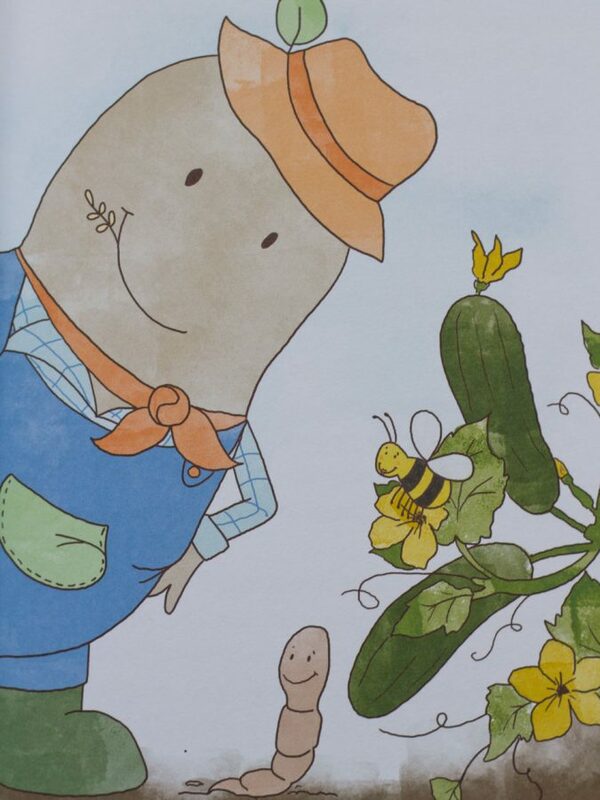 In this latest story from Mulberry Farm, Herbert Peabody hears that his new neighbour Bee is having trouble finding enough pollen. Things are looking dire and Bee may need to move away, sparking Herbert to take action to help. Meanwhile, there’s a mystery brewing at Huffelton House as The Voice That Belongs to Nobody scares away anyone who tries to visit the neglected estate. This book bounces along with captivating language and sweet illustrations that draw kids in as Herbie tries to solve the mystery of Huffelton House and save the bees. Will the bees be ok? Who is behind the door? We couldn’t wait to find out how the story ended… let’s just say that we were buzzing with joy! This is a really lovely kids book about the environment that combines education and entertainment in a way that the kids will enjoy. Herbert Peabody and the Incredible Beehive is available now and you can grab your copy here. Herbie also shares notes that will help parents and teachers, gardening information and colouring in pages for the little ones on his website. Pop on over and check them out, they’re really fun!